I can't really see a way to talk about this issue without dropping a pretty significant spoiler. It's better to tear these things open quick like a band-aid, so back out now if you're already certain you wanna approach this issue with a completely clean slate. This issue features Silk as our special guest star. And Deadpool's in maximum medium-awareness mode, so gird your loins for Robbie Thompson's tight five minutes of self-deprecating "didn't you get cancelled?" humour. Chameleon's unleashed his horde of super-powered LMDs to cause general mayhem in Manhattan and advertise them to villainous buyers. This is made painfully clear by threading together redundant plotlines from the "Bobbi Morse's SHIELD remnant AKA Husk at a keyboard" and "Deadpool's helicarrier full of crazies" points of view as well as by having Spidey stumble into a bank-robbing Hulk-bot. It's pitching into that impromptu fight that introduces Silk to the mix. She and Spidey display some excellent banter chemistry before Deadpool goes Kool-Aid-Man-ing through the fourth wall to crack jokes about Silk as a Marvel character rather than as a person. I do not think this is the dramatic revival that Silk's fans have been waiting for. After the narrative complexity of the previous episode, this issue pans out as a very straightforward "we don't like each other much but we really don't like that villain so let's just focus on beating him up" type of story. But it's not over by a long shot; #30 concludes with a cliffhanger that puts Chameleon temporarily on top of the conflict. When will this story continue? I honestly have no idea. The solicits have gone wonky and it's unclear whether we'll have one or two fill-in issues or maybe forge straight ahead with this story in #31. While there's some enjoyable humour on display here, I simply cannot say that it's compelling enough to invest in following this title's ridiculous issue-to-issue schedule. This is a story that's begging to be followed in a cheaper, slower way - via bargain-bin hunting, trade-waiting, or Marvel Unlimited. 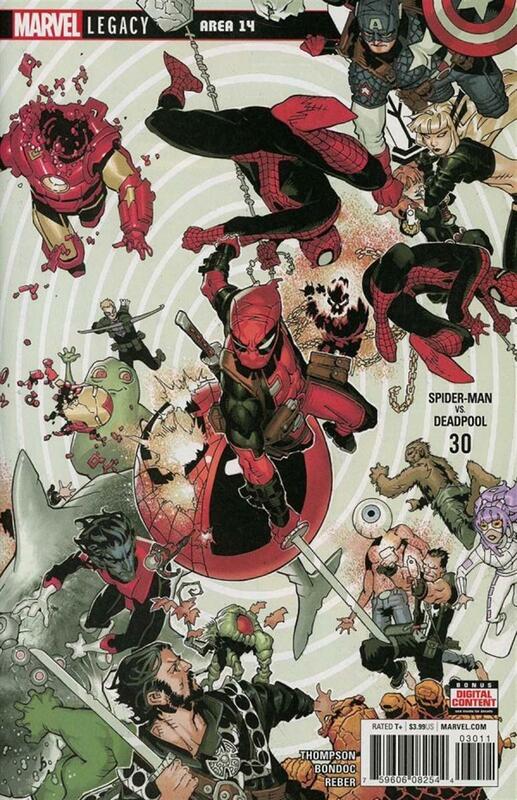 I would probably be a lot more satisfied with this issue if Chris Bachalo had held onto the art duties. Elmo Bondoc fills in with some visuals that are decently finished, but also pretty much impossible to describe as anything but an imitation of Mr. Bachalo's work. The imitation extends to Brian Reber's colouring as well, which is a somewhat more successful echo of Chris O'Halloran's work on previous issues. The jokes are pretty funny, but not funny enough to justify clamping the brakes on the story or wasting a now-rare Silk appearance on Deadpool mockery. Also, Mr. Thompson and Mr. Bondoc team up to deal some terrible damage to Bobbi Morse's share of this story. She's occupied with her own LMD fight, but the brief cutaways to her feel narratively superfluous and visually confusing. Did I take a point off the rating solely because Mr. Bondoc flubbed the shark joke? I'll never tell. This comment is pretty dang suggestive, though, huh?